There are plenty of reasons to visit the treasure that is the National Memorial Arboretum in Staffordshire, but Christmas will make any trip that extra bit special. The Arboretum is a living tribute to all those who have served, and continue to serve, their country. But the 150-acre site, which is dotted throughout with impressive and moving memorials, is also an evolving, maturing woodland landscape containing some 30,000 trees. 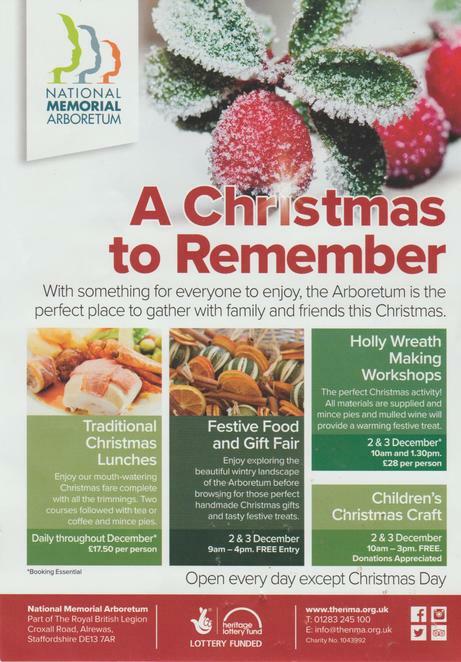 So, what better place to visit during December and over the festive season when the Arboretum, situated at Alrewas near Lichfield, unveils its Christmas programme filled with tasty treats, seasonal crafts, and carol singing, alongside the guaranteed warm welcome. 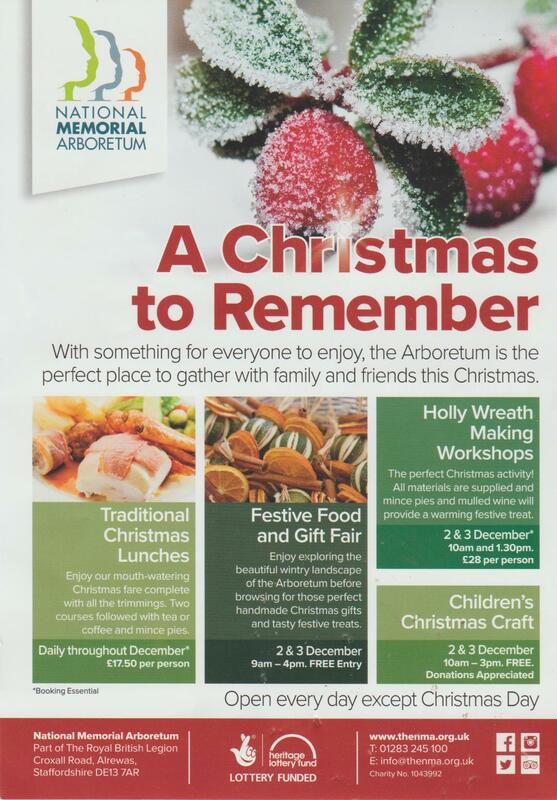 The seasonal treats get underway on Saturday 2 December and Sunday 3 December when the Arboretum stages a Christmas Food and Gift Fair within the site's Heroes' Square area. The food and gift fair, which takes place between 9am and 4pm, will give visitors the chance to browse for those ideal handmade Christmas gifts and tasty festive treats. Over the same weekend, younger visitors will be able to take part in Christmas children's craft sessions from 10am to 4pm. Children visiting the Arboretum during December 2 and 3 will be able to try their hands at making hand-crafted breakfast bites for their hungry feathered friends. The children's craft activities are suitable for all ages. Both events are free, but parking charges apply. Also during the weekend of December 2 and 3 are the Holly Wreath Making Workshops which provide visitors with the opportunity to create a beautiful bespoke wreath for your front door. The two-hour tutorials, which take place on each day at 10am and 1.30pm, cost £28 per person which includes all the materials and instruction you need to create an elegant, natural holly wreath using holly, flowers, pine cones, sparkles and ribbons. Mince pies and mulled wine are also included for a warming festive treat. The 1.30pm workshops have already sold out on both December 2 and 3, but there may still be a very limited number of places remaining on the 10.30am session on both days. On a more sombre note, there will be a Memory Lane Café on December 15 between 10.20am and 12noon in The Founder's Room. The monthly reminiscence café returns on the eve of Christmas to once again provide an opportunity for people living with dementia and memory loss to visit a safe and understanding environment, accompanied by their relatives and/or carer. Each of the free monthly sessions are themed, and will utilise images and objects to stimulate the recall of experiences. This month has a music focus, with music by Richard Thorpe and Mark Gallagher. Those wishing to attend Memory Lane Café must phone 01283 245 100 to secure a place as space is extremely limited. The seasonal festivities then return on Saturday 16 December with Carols by Candlelight, which starts from 6pm. The traditional Christmas carol concert will be held in Heroes' Square amongst illuminated trees and hundreds of candles for people of all ages to enjoy a variety of sing-along festive music. The concert is free to attend but carol books, candles and refreshments are available to purchase. Earlier on the same day, children are being encouraged to take part in a December Wildlife Watch within the Arboretum grounds between 10.30am and 12.30pm. The Arboretum is home to a wide variety of wildlife, from tiny insects to birds and mammals, as well as trees and flowers for nature-loving young visitors to explore and discover. Children, who must be accompanied by a parents or guardian at all times, will then be able to celebrate Christmas at their very own Wildlife Watch Christmas party. The cost is £1.50 per child, with advanced booking required. As well as the above listed special seasonal events, the Arboretum will also be holding traditional Christmas lunches every day throughout December complete with all the trimmings. Booking is essential so please call 01283 245 100 to book. The cost is £17.50 for adults and £9.95 for children. The Arboretum is usually open daily.